GitHub is free for public and open source projects. The cheapest paid plan is Developer for $7/month, which includes Personal account, unlimited public repositories, unlimited private repositories and unlimited collaborators. 1. Open a GitHub account. There are a lot of options - but you don't have to worry about all of them to get started. They make it as easy as possible, with lots of help on the site. 2. Download the GitHub Desktop. Both Windows and MacOS are supported. 3. 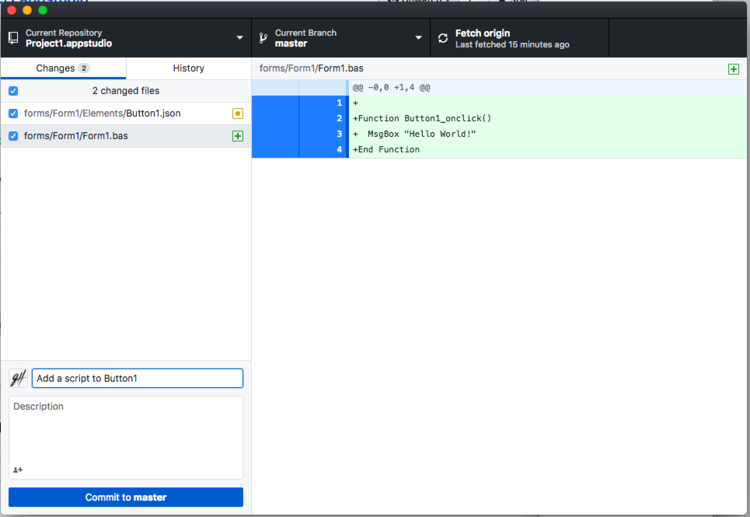 Using the GitHub Desktop, log into your GitHub account. 1. In the GitHub Desktop, choose "New Repository..." from the File menu. 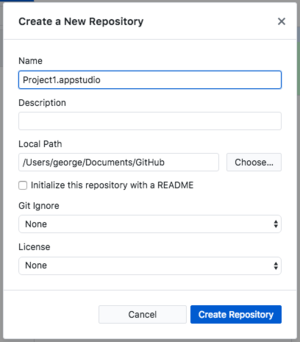 Enter the name of your project folder, including ".appstudio" into Name. "Local Path" should contain the directory your project folder is in. Click on "Create Repository". 2. The repository will now appear in the GitHub Desktop. Click on "Publish repository" at the top right of the screen. 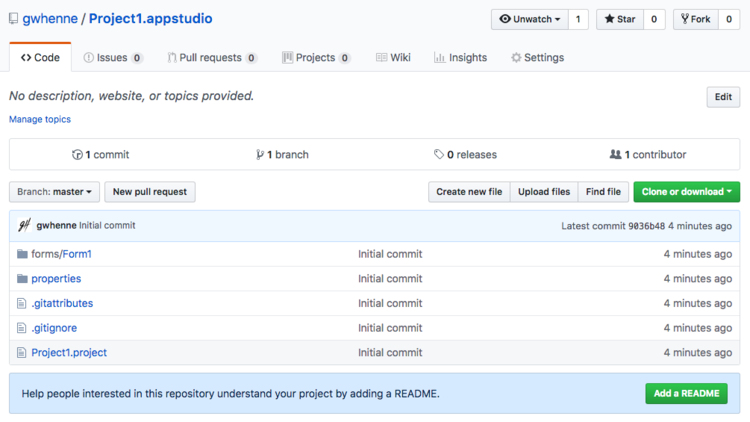 It will ask to confirm that you want to publish the repository, then it will upload it to the GitHub website. 3. You can now go to the GitHub website and see your project there. You can see the directories and files which make up your project. Explore some of the options and features. Now that we have our project in a GitHub repository, what happens if we modify our app? Let's add a script to a button in AppStudio and save the project. Here is the updated Github Desktop. Notice that two files have changed: Button1.json now has a link to the script, and Form1.bas has the new code. Review your changes here to make sure they are what you want, fill in a description and "Commit to master". When you are ready to push all your changes to the GitHub website, click on "Push origin" at the top of the screen. Have a look at the History tab in GitHub Desktop. You will see the changes you have made to the project. If another developer also made changes to the project, those changes will appear as well. It's an easy way to see what your collaborators have been up to.